Sometimes product design is so good you don't even notice it, and that's very much the case with David Mellor's mid-century street furniture, which is being celebrated in a recently opened exhibition at the late designer's factory near Sheffield. 'They are so familiar everyday items, you don't think anyone designed them,' says Corin Mellor, David's son who is now at the helm of the design business synonymous with the name Mellor. The exhibition Street Scene brings together some familiar items including bus shelters, street lights, bollards and traffic lights that are still used on Britain's roads today. The objects were obtained over several years with funding from the David Mellor Trust and form part of a larger project to redevelop the factory site, just outside the village of Hathersage. On it sits the splendid Round building, designed by architect Michael Hopkins in 1990 and housing the David Mellor Design Museum. Visitors pass the street furniture exhibition on their way to a factory tour or a bit of retail therapy in the shop or stopping in the adjacent cafe, now with an outdoor terrace. The aim is to tell a little bit of the David Mellor story before they go inside and appreciate that this British-design great was not just responsible for some, albeit beautiful, cutlery. Corin Mellor and I begin by looking at the lamp post. 'My father was in Rome on sabbatical from his studies at the RCA and was really taken with the elegance he found in the Borghese Gardens,' he explains. 'He had this idea to reenact a street scene in the UK. After driving around in his Morris car visiting various manufacturers, a firm called Abacus in Derby agreed to put it into production, and it then went on to also make the park bench, presented in the exhibition in a white version, and the colourful litter bins. 'He had these amazing new materials at his disposal such as tubular steel, from which these tall, slender lamp posts could be produced that would bend and take any impact instead of shattering.' Prior to this in the pre-war period, street lights had been made of cast iron, and after that concrete. 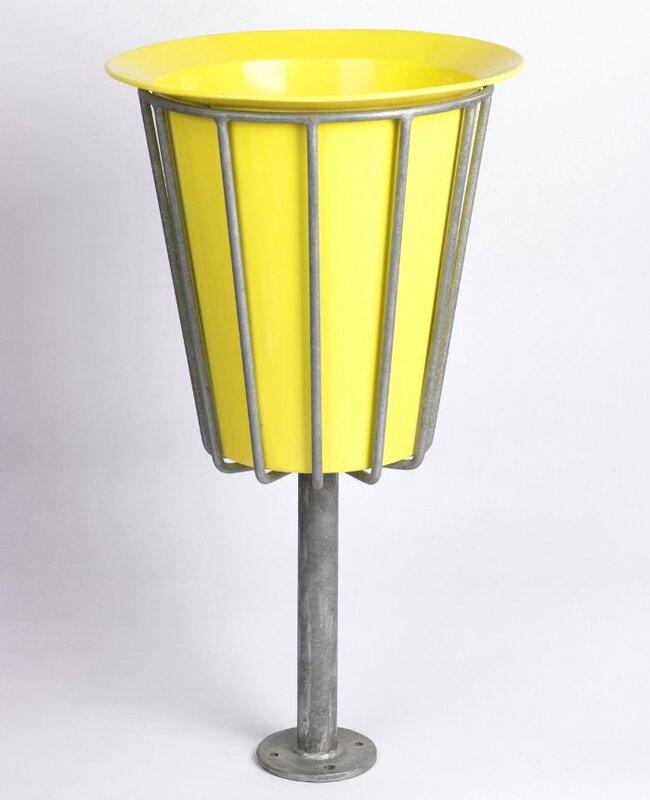 With the traffic light, plastic had arrived and so it was possible to make something that was virtually maintenance free. All components were polypropylene or PVC and Mellor recommended that the backing boards and hoods should be made of plastic too, to increase their resistance to impact. Another feature of the traffic light was that it was designed for both cars and pedestrians, the systems that predated it were more like rail signals and less people-friendly. 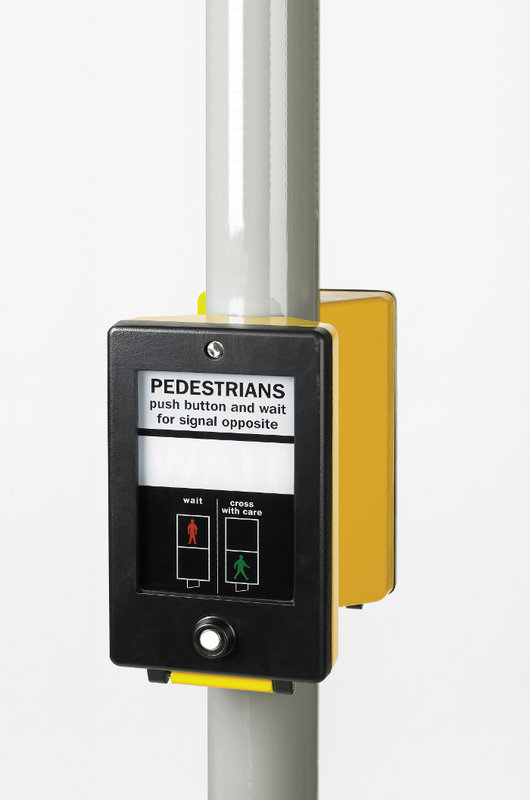 Mellor's designs on the other hand incorporated a button for pedestrians to press and instructions so simple a child could understand them or someone for whom English was not a first language. Mellor felt it was vitally important for the safety of all road users for the message to come across with complete clarity. One of Mellor's main concerns was that the previous system had been cluttered with additions and attachments. The white surround of the traffic lights made for better visibility for drivers and they can be angled to the gradient of the road. 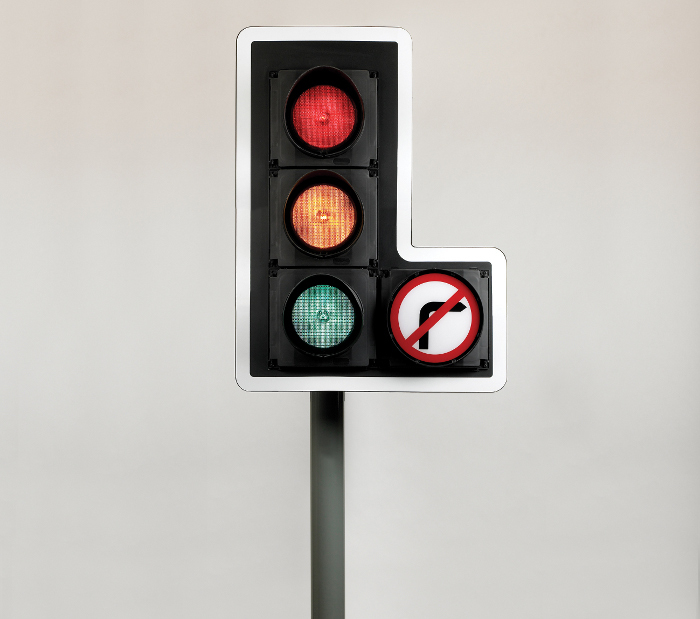 The traffic light system was also modular so could be adapted to whichever configuration was required, including signs such as 'No left turn' and filter arrows. When it came to replacing a bulb, the unclipping and pivoting of a few pieces would give easy access to what were known by enthusiasts as 'Mellor heads'. Modularity was also at the heart of the cleverness of the bus shelters with the pieces of galvanised steel able to form shelters of various sizes, either partly enclosed or cantilevered. The sheer numbers in which the bus shelters were produced - some 140,000 - is testament to the success of the design. 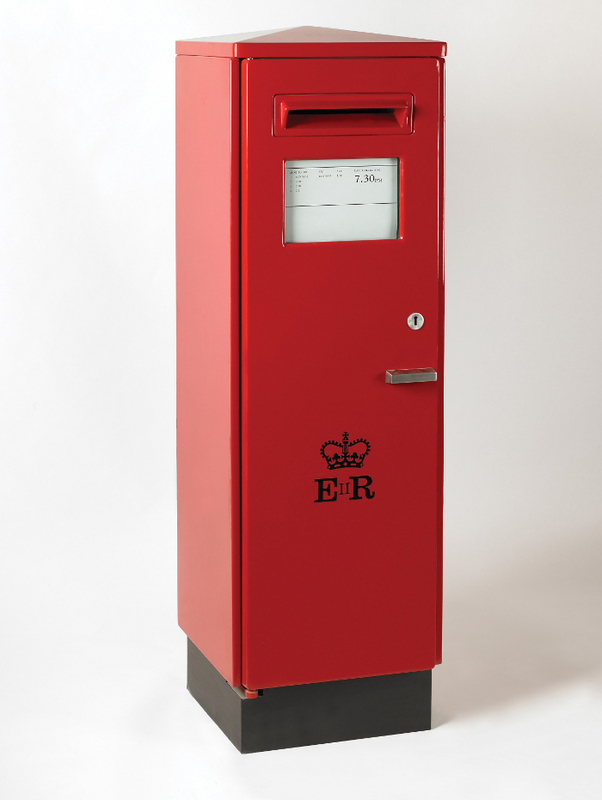 Mellor was also responsible for a new, square post box, which was revolutionary at the time it was introduced in 1968. Using an inner clearance mechanism to which the postman hooked his bag, forming a chute for the letters to slide down into the bag, the redesign reduced collection times by half. Despite some protestation from the public who preferred the round pillar box design, like much of his street furniture Mellor's post boxes are still in use too. Just as with the Mellor's post boxes, the public is often resistant to changes to its urban environment, viewing them as a form of visual pollution or cultural vandalism, particularly in places where the picture-postcard vision from the past remains. This is what makes the City of Bath's inroads into developing its own distinctive set of street furniture all the more remarkable. 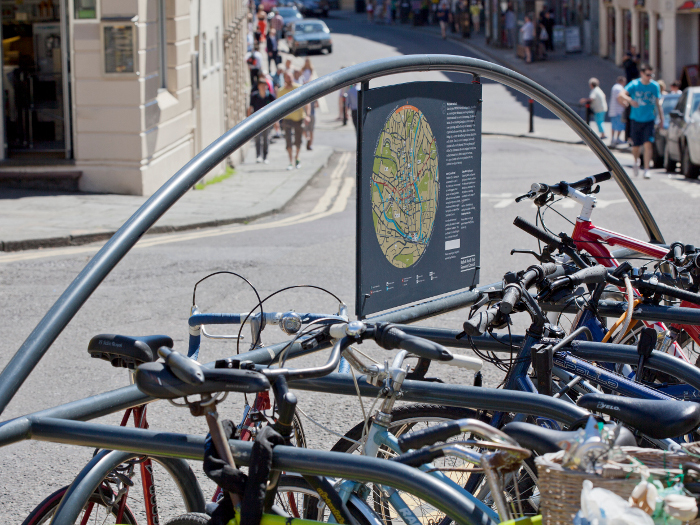 This has come from a wider strategy entitled Creating the Canvas for Public Life in Bath, which has a remit to transform Bath's streets and public spaces over the next 15 to 20 years. Design studio PearsonLloyd was commissioned to create the wayfinding system, in collaboration with graphic information-system designers CityID and FW Design. This came with its own inherent challenges. Bath is the only entire place in England that is designated as a World Heritage Site so anything new would have to work in harmony with the picturesque cityscape. But you can't put an entire city in aspic and there were 21st-century needs, namely getting around, which had to be matched with the stiffness of Bath's Georgian architecture, the romanticism of its squares and the accidental spaces and promenades in between. The brief therefore was to help revitalise the economy, identity, vitality and relevance for the residents and visitors of Bath. It is hoped that people both young and old will actively discover and contribute to life in 2014 and beyond. 'We tried to represent this extraordinary place; this hub of art, architecture, commerce and culture. We had to show what Bath meant,' says Luke Pearson. The answer lay, he continues, in geometric forms, notably the circle. 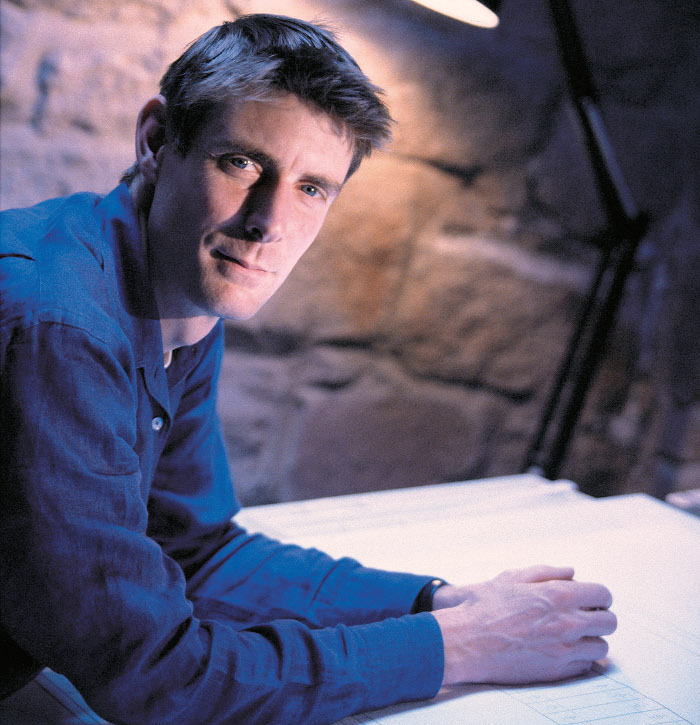 PearsonLloyd believes that a recurring form in nature, it captures the spirit of Bath - from the shape of the city itself, which is contained in a natural bowl where the Avon Valley widens out, encircled by hills, to the curves of the Circus, the 18th-century architecture by John Wood, which is often the first image that comes to mind when thinking of the place. The resulting design was a circular, vitreous enamel map, designed by FW Design. The colour palette has been chosen to show the jewel-like qualities of the blue and grey-printed material in their best light. Along the edge of the map are details of how long various destinations are by foot, enabling tourists, day visitors, families, business people and shoppers to navigate and explore the city. Each map is set in a bold, bronze monolith with the enclosed round form referencing traditional scientific instruments such as the compass, lens and sundial. 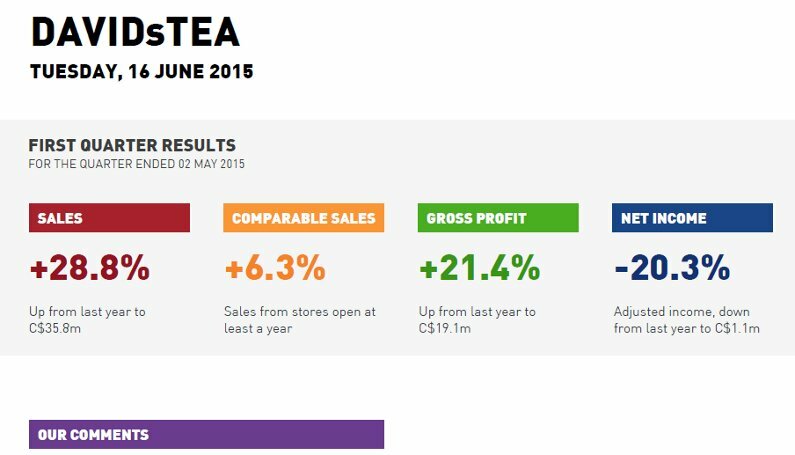 'We achieved the Bath DNA through the quality of the materials used,' explains Pearson. The studio created a material strategy that used finishes that were beautiful, sustainable and low wastage. Bronze was also chosen for its durability and its ease and cheapness of maintenance, as well as its aesthetic quality. Using an age-old material such as bronze in a new insertion also achieved the balance of traditional with contemporary and it has an authenticity that complements Bath's local stone and slate roofs. 'It was important that the design felt important and used noble materials that don't wear out. Bronze ages over time, acquiring a beautiful rich patina, and you can't really damage it,' says Pearson. 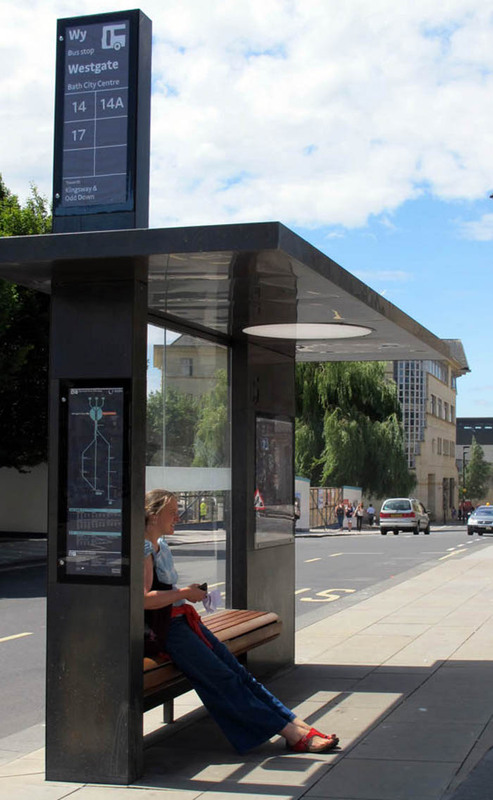 The wayfinding monoliths are complemented by several bus shelters in the city centre that provide a powerful, modern presence among Bath's traditional streetscape. 'There's also a lovely mix of informal and formal that really allows the city to breathe,' PearsonLloyd. The design language of the new pieces are a counterpoint to Bath's Palladian architecture. 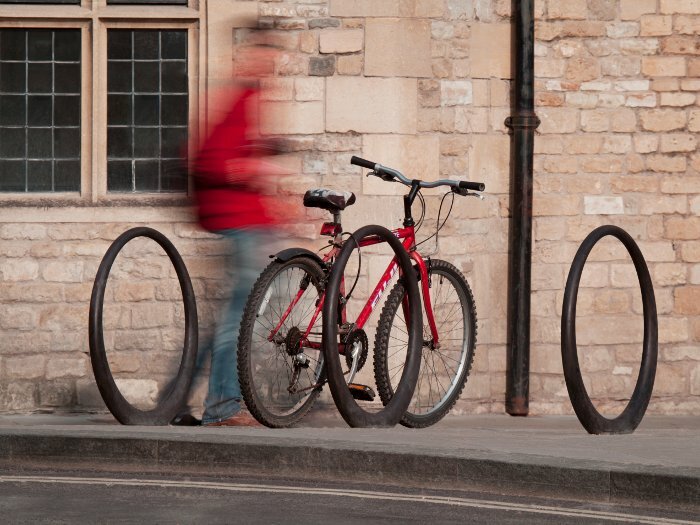 PearsonLloyd has also designed a range of street furniture for the city that includes benches, cycle stands, bollards, street trading units and fountains. 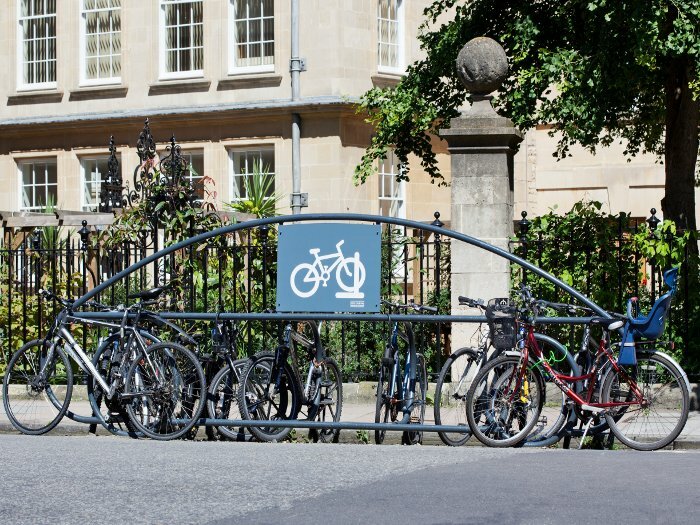 Already bench in timber and cast bronze, individual circular bicycle stands and ones in the shape of a car (to illustrate that two wheels are better than four) can currently be found on the streets of Bath. This has been a long-term project for PearsonLloyd, which began working on urban furniture for Bath and North East Somerset Council in 2009. The services of several UK-based manufacturers were called on, including Draycast Foundries from Buckinghamshire, Factory Furniture from Oxfordshire and Wood&Wood Signs from Exeter. PearsonLloyd isn't the only wellknown design practice to get involved in more recent forays into street furniture. At this year's Milan Furniture Fair, Zaha Hadid launched the Serac bench for Lab23, featuring her signature undulating forms and inspired by the ice formations created within intersecting glacial crevasses. Despite its delicate-looking, curvilinear appearance, it is composed of resin quartz, a tough and durable material able to withstand the rigours of public space. German designer Konstantin Grcic has got in on the act too, creating a modular outdoor seating system. Bench B, produced for Bd Barcelona, is based on Mies van der Rohe's Barcelona chair. On the east coast of the United States, the Design Museum Boston has used design to bring communities together via a street furniture design competition for the Fort Point Channel, which separates South Boston from the downtown area, feeding into the Boston Harbour area. Last autumn the museum invited individuals to rethink the public bench and come up with something iconic to improve the livability of this burgeoning urban area, while at the same time being socially and environmentally conscious. Having received some 170 entries from 23 countries, a resulting outdoor exhibition features 17 public benches. The final furniture designs had a focus on reuse, using environmentally friendly materials. These range from an oversize rope design by Marco Goffi Design in Milan to the deckchair-like Chroma bench by Boston-based studio Make Stuff Lab, while the top prize was scooped by the design of the Bowsprit bench by Rui Chen, Christa Lee, Sanchit Mittal and Wendell Wilson of the Georgia Institute of Technology. The brief also called for the designs to improve neighbourhood health and vitality and transform what had been neglected or inaccessible areas into places that foster multigenerational, community interaction. These could consist of tables, planters, play equipment, interactive sculptures or other structures that make a small space seem inviting, usable and safe. Materials must be readily available or reused. The winning designs are part of a year-long community installation, after which time they are considered for permanent installation or relocated to a new vacant site in Chicago. Whether it's located in a pretty bit of the Peak District, a rough-andready bit of Chicago or a smart part of Bath, the continuing evolution of street furniture should be celebrated for its role in removing design from elitist status into something that is democratically for the masses.